100% PREMIUM LYCRA - Our Premium Athletic Series Running Armband is made with 100% Lycra - luxurious to the touch, ultra-light weight, gentle on the skin, water and sweat resistant and highly durable. OPTIMAL FUNCTIONALITY - Comes fully loaded with features and more! 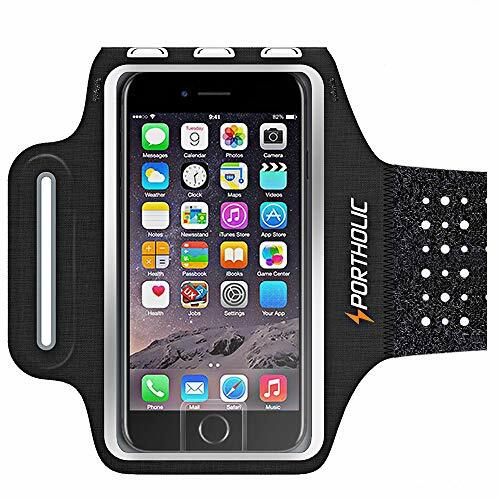 Our phone armband is a perfect addition to your running or workout accessories! Includes (1) water-proof touchscreen that is highly sensitive (2) ultra-bright reflective strip for safety in low light conditions (3) pocket for cards & key storage (4) advanced SBR pad to prevent slippage and provide added comfort during wear (5) perspiration pockets to enhance breathability (6) headphone cord holder (7) multi-port outlets. UNIVERSAL FIT - We designed the perfect size for every phone. In addition, the adjustable elastic band is made with 100% stretch Lycra and can easily expand and contract to accommodate both large and small arms. Go ahead, add it to your cart! You won't regret it! Our premium armbands are the ideal workout accessories for men or women whether you are running, walking, cycling, hiking, working out at the gym or at home! UNIVERSAL PHONE ARMBAND - Our premium running armband is designed to fit all plus size smartphones (see fitment guide below). A perfect hands-free solution for your smartphone so you can focus on your workouts. Enhanced with weatherproof technology to keep your phone safe and protected from rain or sweat, and an extra-thick reflective strip for safe running at night. 100% SATISFACTION LIFETIME GUARANTEE - Our premium armbands come with a 100% satisfaction guaranteed. If you are not completely satisfied with your purchase, we will refund you fully or send you a replacement free of charge! No questions asked! We are 100% dedicated to providing you outstanding customer service, your questions or concerns will always be addressed timely and to your satisfaction! That is our commitment to every single customer. PHONE MODELS - The ideal phone holder for iPhone X, Xs, Samsung Galaxy S9, S8, S7, S6, A8 and other phone models similar in size and dimensions. 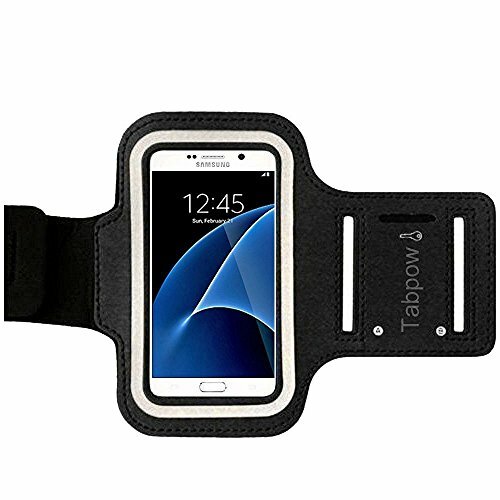 PREMIUM BLACK PHONE ARMBANDS FOR RUNNING holds just about any smartphone 4 to 7.9 inches including a wide variety of iPhone, Samsung Galaxy, and many others. Your phone is securely held in place by strong elastic bands. Takes just a second to insert your phone. 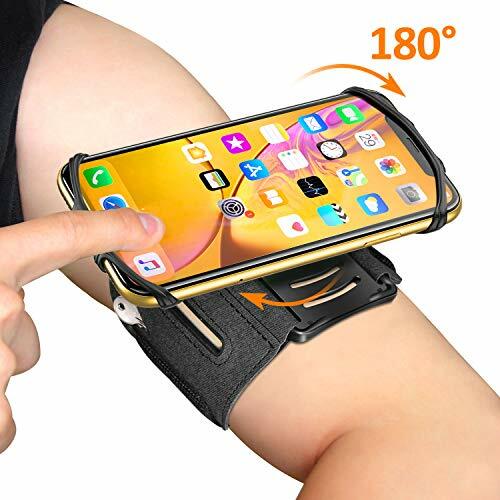 Mobile holder armband for exercising fully protects phone from drops, falls, slipping and other mishaps that can crack the screen and damage the case. Just in case you're looking to accessorize with a little color, the armband comes in black, blue, pink, green, and silver. 180 DEGREE ROTATION lets you turn and angle your phone for best view. Turn it one way for walking, another when lying down, another when sitting, and a different way to get maximum clarity in direct sun or night time conditions. Great for talking, surfing the web, watching movies, videos, and reading news and Kindle ebooks plus much more. FULL TOUCHSCREEN DESIGN ensures complete access to your phone's navigation, finger scanner, change songs, text, face time and plug in headphones. 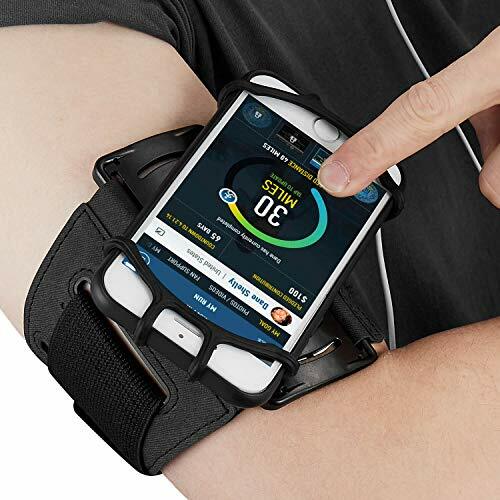 Exercising phone armband for allows you to focus on your workouts without distraction. 100% MONEY BACK GUARANTEE ensures this will be your best bet for a pleasing no-risk purchase. 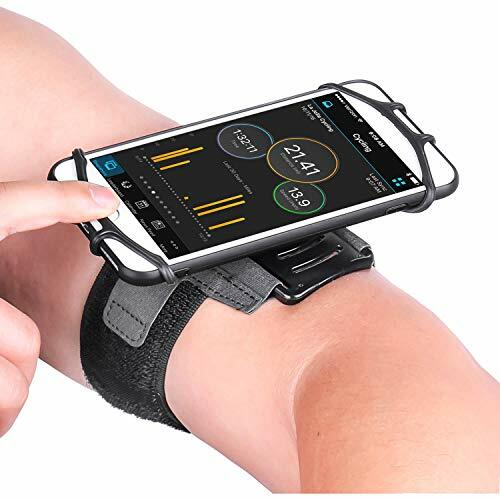 Many customers love this cell phone workout armband so much they return to buy another to keep in the car with a third to save in their desk drawer at work. Premium Materials & Universal Sizing Made of stretch resistant silicone, fit Larger smart phones up to 7.9 inches and recommend for phone screen diagonal up to 7.9". Multi-slot wrist strap adjustable velcro will fit almost any arm size up to 16". 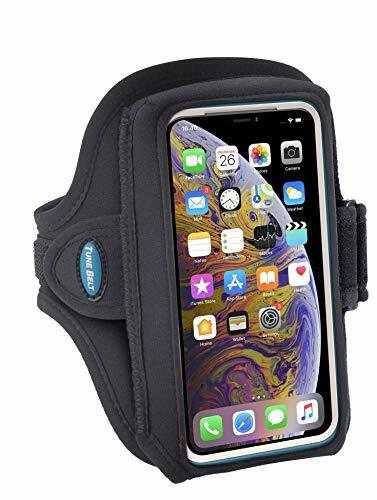 100% Premium Construction - Our Premium Athletic Series Running Armband is made with premium Polyurethane and a mixture of Lycra and Neoprene to provide optimal comfort, extra protection for your phone as well as water resistant capabilities. NEW HEADPHONE HOLE FEATURE - If you enjoy listening to music while on the go, this armband is just what you need. We recently added two slots on the bottom of the sleeve where you can easily insert your headphone cord and connect to your device. The headphone holes are positioned to work for any smartphone. This stunning Armband is much different from others you will see on Amazon by offering exceptional quality and comfort while giving you the best looking Armband in the gym. BRAND NEW 2018 DESIGN - As seen on FOX, NBC, ABC & CBS! One of the best stocking stuffers for men. Most other phone armbands are bulky, uncomfortable to wear because they have fabric and material that can scratch you or cause irritable chaffing on your skin. Our engineers have resolved this problem by designing an armband that is soft and made more like a compression sleeve. Ensuring that it will be extremely comfortable on your arm no matter your arm size or size of phone you have. 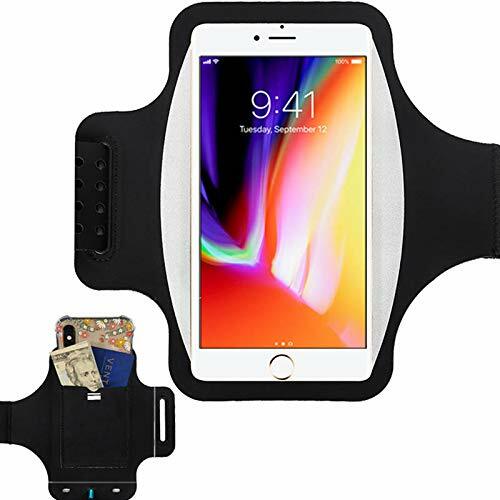 FITS ALL PHONE SIZES & MORE - This Armband has enough room to store your phone (no matter the size from 2 to 7) because of its stretchy spandex material. It can even fit more stuff besides your phone. Its a perfect pouch for your keys, wallet, money and more. Now you never have to worry about your stuff when being active. The Armband also has a REFLECTIVE LOGO to keep you safe and seen at night. Stay focused on achieving your goals instead of worrying about cars not seeing you in the dark! 5 STARS FOR COMFORT - Finally, an armband that you never have to readjust or worry about it slipping during physical activity. Perfect gift for mom! Made with quick drying breathable fabric of 85% Nylon and 15% Spandex, you will barely feel the armband on your arm. The hugging fit will feel like no other armband you've had before. Please measure your bicep to find out which size is best for you. SMALL <10, MEDIUM 10-14, LARGE 14-16, EXTRA LARGE 16-20. FOR WOMEN & MEN - One of the top gifts for women & men ! Xmas is coming around the corner and Christmas Gifts for Mom and Dad are not always the easiest to get. It is great for all ages of Boys, Girls, Adults, Kids, Seniors, Mom, Dad and Teens. Next time you are looking for Christmas Gift Ideas & Stocking Stuffers for her or him then this is a Christmas Present they will be happy with. You can even choose gift wrapping at checkout. Get them the Present they'll love. Size For ALL PHONES with diagonal screen size up to 6.7 Inch(without any case). Both regular and plus size iPhone are compatible. The capacity is equivalent to an iPhone 8 plus in a slim case. Easily fit any arm sizes from 7.5 to 18.5 Inch (19cm ~ 47cm) in circumference with an extended strap. Support ID Touch Fingerprint Unlock. RESIST SWEAT & SKIN FRIENDLY PORTHOLIC sports armband features NON-SLIP foam padding at the back, for superior comfort and resisting sweat; water-proof TPU as front cover; VENTED STRAP to keep your arm cool and dry during your most intense workout. TOUCHSCREEN COMPATIBLE The clear window offers protection while retaining touch screen functionality, so you'll be able to change songs and reply to messages without having to remove your phone from the armband. EXTRA FEATURES A built-in hidden pocket allows you to tuck in your credit card, ID and keys instead of putting them in a smelly gym locker; Reflective strip makes it ideal for night running and there are cutouts for easy access to headphone and charging ports. Worry-free purchase We provide 100% money back guarantee and excellent customer service. Jennifer and Dave is your customer service rep in PORTHOLIC. They are amazing! Please don't hesitate to write in even just to say hi. FITS OTTERBOX and LIFEPROOF CASES - Keep your case on! Design fits iPhone Xs X 8 7 6s 6, and Galaxy S6 S7 S8 S9 S10 when these devices are inside an OtterBox Defender, Commuter, LifeProof or other large case. EXCEPTIONAL COMFORT - For women and men, the soft, cushioning fitness armband maintains a secure grip with comfort. It won't bounce, slip or feel too tight allowing you to move freely through your exercise. SWEAT-RESISTANT - With no openings directly on the skin and neoprene fabric that wicks away moisture, this sport armband provides protection from perspiration and the elements. MORE FEATURES: Flap to wrap cord prevents tangles for running or workouts at the gym - Touchscreen control - Washable - Lightning connector access. RELIABLE BRAND - Tune Belt has over 30 years' experience and a reputation for high-quality - this exercise armband will not tear or fall apart with regular use at the gym or outdoors. COMPATIBILITY: Fits OtterBox Defender, Commuter and LifeProof FRE and other large cases for the following devices: Apple iPhone X, Xs, iPhone 8 7 6s 6, Samsung Galaxy S6 S7 S8 S9 S10, and Google Pixel. UNIVERSAL PHONE ARMBAND Our premium running armband is designed to fit all plus size smartphones (see fitment guide below). A perfect hands-free solution for your smartphone so you can focus on your workouts. SKIN-FRIENDLY Breathable Lycra and Neoprene provide soft, odor-free and lightweight wearing experience. Stretchable and washable with clean water. Extra fabric layer makes the armband sweat resistance when doing workout activity. FULL TOUCHSCREEN FUNCTIONALITY COMPATIBLE WITH FINGERPRINT UNLOCK FUNCTION. 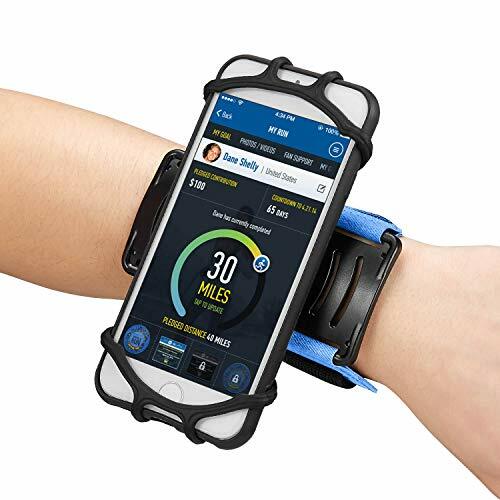 Our encased running armband acts as a workout phone holder while offering full protection and allowing easy access to your phone's touchscreen functionality and headphone jack. Triple Sweat-resistance Three ways to minimize the paths sweat can enter. Covers the entrance with extended cloth; no unnecessary cut out, even the scale of the headset hole is cleverly reduced; extra fabric layer is added to filter sweat. LIFETIME WARRANTY We provide 100% money back guarantee and excellent customer service.If you have any problem with your purchase, please contact us directly to get efficient and hassle-free customer service. Access to headphones and all controls, allow for full functionality during Sports Gym Jogging Workout Exercises. Made of high quality soft material, Lightweight and Comfortable, Secure Velcro, Adjustable Strap. Secure, Adjustable, fit for different arm sizes, easy to install and take off.Water resistant, protect your phone from chips, scratches, and environmental damages. COMPLETE UNIVERSAL FIT FOR EVERY ARM & PHONE - Introducing our all new armband designed to fit EVERY SIZE OF ARM. Using powerful strap to wrap around your arm comfortably, you can be assured the armband stays snugly in place during vigorous activities. To keep your phone in place, we use a new type of strong stretchy rubber that is specially designed to stretch and fit your phone screen no matter it's size. These bands can be stretched to hold PLUS SIZED & REGULAR SIZED phones firmly in place. 5 STARS FOR ACCESSIBILITY - Finally, you have complete access to all your phone's functionality while it is in your armband. 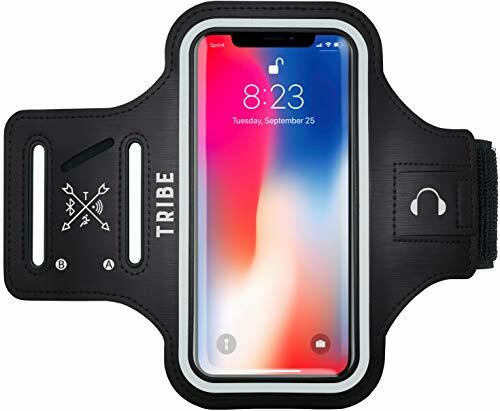 No more having to open a zipper to access your phone, or fighting with the unresponsive clear plastic casing that goes over your screen like many other armbands have. This FULLY OPEN CONCEPT armband will make your runs and workouts so much more enjoyable by being able to easily use your phone's finger scanner, change songs, text, face time and plug in headphones. 180 ROTATION for OPTIMAL VIEWING - Easily rotate your phone 180 degrees for better viewing. This is the feature you didn't know you needed until you've experienced how much time it will save you. NO MORE having to pull your phone out of an armband to get the right viewing angle to read a text. Just simply use our easy turn swivel and view the text on the fly. Now you can watch videos, type messages, Face-time & read eBooks all while your phone is being comfortably held up by our armband. BRING COMFORT TO YOUR EXERCISING - **As seen on FOX, CBS, NBC and ABC. ** Featuring the all new LIGHTWEIGHT and BREATHABLE flexible arm strap that hugs your arm and assures the Armband will stay in place during your run or work out. Our all new design has vents to keep air flow between your arm and phone. Our SOFT but durable fabric will allow you customize your Armband to fit your arm PERFECTLY! In just a few seconds you will have this Armband Holster adjusted to fit your arm comfortably! 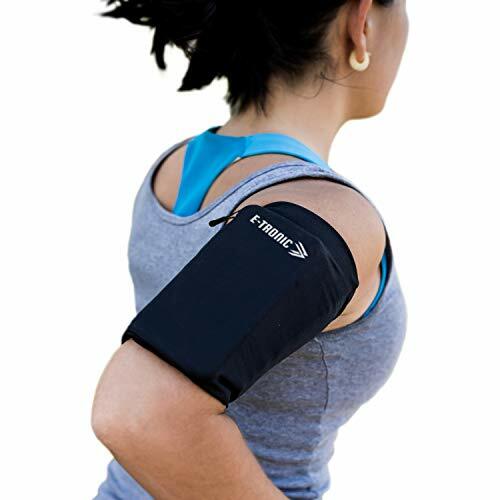 USE THIS ARMBAND FOR EVERYTHING - If you enjoy WORKING OUT, HIKING, CYCLING, JOGGING, WEIGHT LIFTING GYM TRAINING, OR ANY OTHER SPORTS, then this Armband is perfect for you. Unisex design makes it great for all women, men, teens, boys and girls to use this armband. This stunning Armband is much different from others you will see on Amazon by offering exceptional quality and comfort all at the same time of giving you the best looking Armband in the gym. 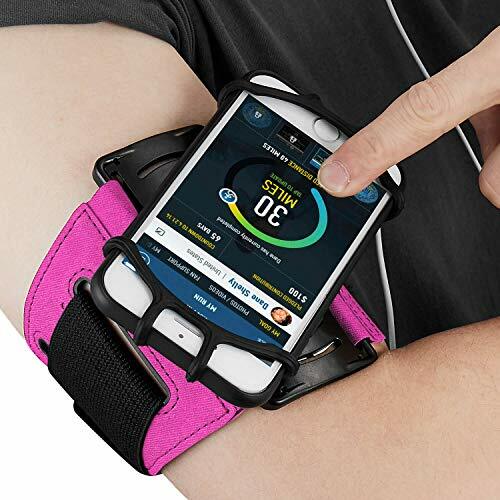 The Run Tie Sports Running Armband enable you to enjoy music when you are exercising. Perfect for running, jogging, hiking, fitness and working out in the gym. Adjustable soft band supports a wide range of arm girth from 10 (25.4cm) to 15 (38.1cm). Adjustable velcro strap protects and stabilizes device without slipping or constricting. COMPATIBILITY - Fit all 4 to 6.5 inch smartphones such as iPhone Xs Max/ Xs/ XR/ 8 Plus/ 7 Plus/ 6s Plus/ 6, Galaxy S10 Plus/ S9 Plus/ S8/ A8 Plus, Note 4/5/8/9, Google Pixel 3/2 XL etc., also, it can fit those phones with Otterbox/Lifeproof Cases. Please read the description to see complete compatibility list. ALL SCREEN FRIENDLY - Upgraded silicone straps to fit all screen phones better, especially for iPhone Xs Max/ Xs/ XR/ X, will not block the face id and bottom part where you slide up to gain access to the phone itself. DETACHABLE & 360 ROTATABLE - Upgraded to be detachable!! !A lot of VUP customers are looking for this feature, finally it's available, besides detachable function, we've also upgraded the 180 Rotation to 360 Rotation. FIT FOR MOST ARMS & WARRANTY - Adjustable band and Highly elastic velcro to enjoy a comfortable fit, get peace of mind with a 30 days satisfied or a fully-backed 3-year warranty. FULL ACCESS & PERFECT FOR ALL ACTIVITIES - Completely access to all buttons and controls of the smartphone, look cool & Great for running, cycling, walking, hiking, and all of your high intensity workouts. Adjustable velcro band supports a wide range of arm girth from 8.5" (21.6cm) to 15" (38.1cm). The extension band reach to 5 inch(12.7cm). Practical Additional Function: The armband is printed a reflective strip to keep visible in low light conditions. Very intimate designs, printed +, - volume button, built-in key pocket, card pocket. In addition, the material is sweatproof, water resistant and washable. Large Adjustable Range: A combination A/B slots gives it a large size range. It easily fits arm girth from 8.3 (21cm) to 15.7 (40cm). The extension band reach to 6.3 inch(16cm). 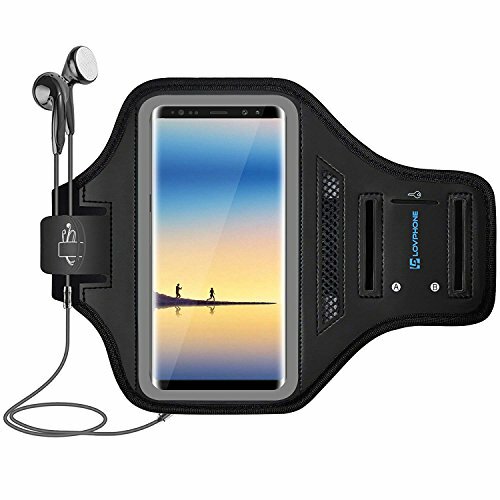 Customized Design: This armband exquisitely designed engineered for Samsung Galaxy S10 (6.1), Galaxy S9/S8 (5.8), Galaxy S7 Edge (5.5). It is big enough even if your phone has been put into normal protective case, and color (Fit OtterBox) Black designed for the phone with a large protective case such as OtterBox DEFENDER case or Lifeproof case. This Matone armband fits all phone sizes on the market. No more struggling to search for a new arm phone holder each time you upgraded your phone. 180 swivel feature allows for the precise angle you want the screen at. No more having to pull your phone out of an armband to get the right viewing angle to operate. Strong rubber band holds the phone on the arm securely and delivers complete access to phone screen control and all buttons. Highly elastic and adjustable velcro strap with two hook for a wide range of adjustments, which will work for larger or smaller arm sizes. Its built-in key holder is perfect for a small key. You never have to worry about having to carry your key in your pocket or losing them during your workout. A convenient velcro strap to hold the cord of your earbuds in place. Just put extra headphone cord so it won't bounce in front of you. At Matone, we back this Phone Armband with 12-month warranty. If you meet any questions, please contact us, we will fix your issue within 24 hours. CASE FRIENDLY & UNIVERSAL FIT - Used with your cellphone case on. 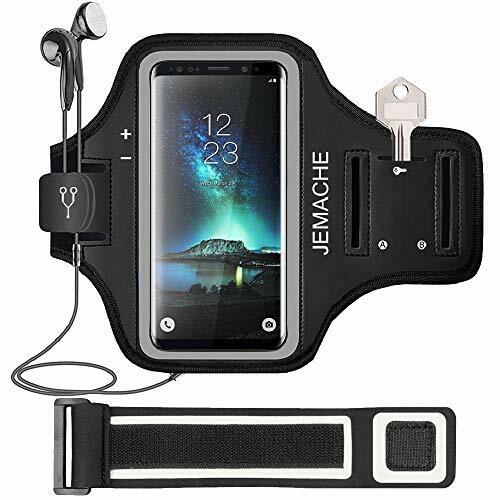 Covers 7.9" screen including iPhone 6s to iPhone Xs Max Samsung Note 6 to 9 Samsung Galaxy S6 to Samsung Galaxy S9+ Huawei Mate Huawei nova LG G LG V. Fits regular size forearms to 6" and also muscular to 9.5"
This Premium Armband is made of high quality Spandex material, which is more comfortable to ware. 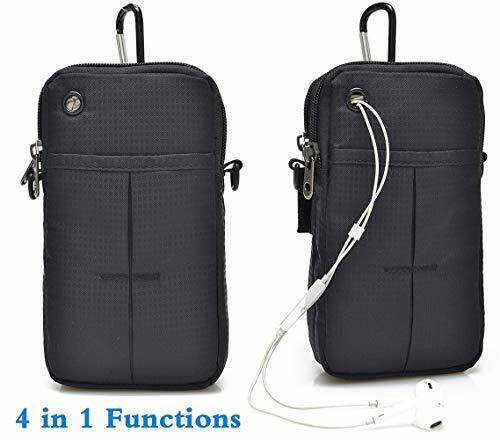 It has 2 large pockets to hold cell phones at all sizes, as well as money, cards, IDs, Keys, and etc. It weighs at only 1 Oz. with elastic strap extending up to 14". With water resistant TPU screen, this running phone holder is touch screen friendly and face ID friendly. In addition, the 2 large reflective safety strips on the sides of the pocket gives more peace of mind in the dark! CASE FRIENDLY & UNIVERSAL FIT - Used with your cellphone case on. 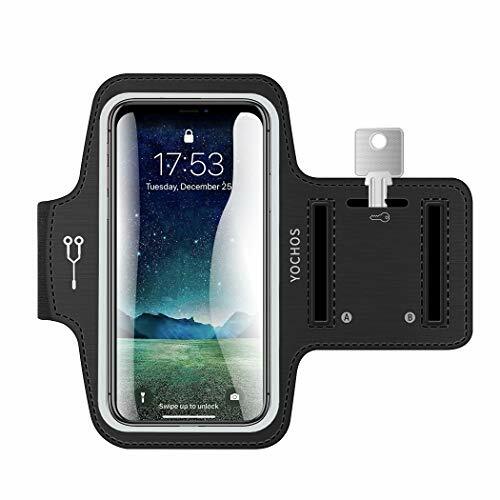 Covers 7" screen including iPhone 6s to iPhone Xs Max Samsung Note 6 to 9 Samsung Galaxy S6 to Samsung Galaxy S9+ Huawei Mate Huawei nova LG G LG V. Fits regular size arms to 8" and also muscular to 16"
Separated 3 Pockets: one pocket to hold phone and the other two for keys,money,ID/credit cards,earphones,cable,power bank,charger and more. Accommodates Most Phones: We've designed the crossbody bag strap runner arm phone holder to be large enough to work with most phones and protective cases for two-layers of protection. Highest Quality Materials: waterproof,breathable,lightweight and comfortable nylon fabric blend is made to flex, twist,and bend. 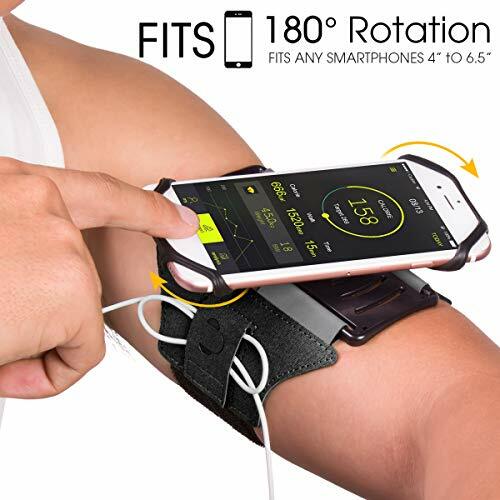 No Slip Fit and Universal Sizing: The phone holder for arm running won't move from your upper arm,whetherever you're running marathons,workout or weight lifting.Our innovative design and adjustable velcro straps securely fit any upper arm with a circumference of 7 to 16 inches. arm holder for cell phone, mens arm band for men boys, arm bag for women girls,crossbody bag mini kids. Headphone Cord Management Jack: Easily access to answer the calling and listen to music while sports.